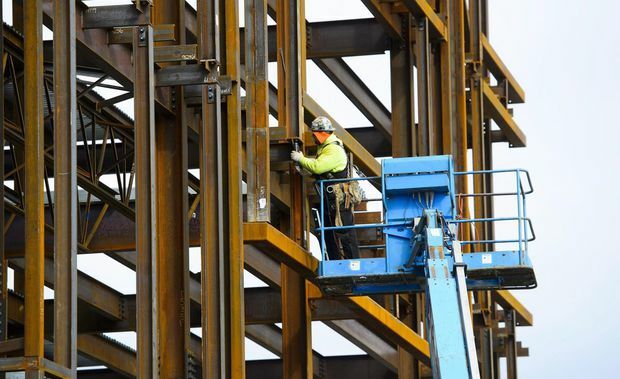 A steelworker builds a structure in Ottawa, on March 5, 2018. A second consecutive month of bumper job gains quelled concerns that Canada’s economy could be headed for a recession and cooled market expectations that the Bank of Canada could cut interest rates by the end of the year. Statistics Canada reported on Friday that employers added 55,900 jobs in February, far exceeding analyst expectations of flat job numbers. The unemployment rate was unchanged at 5.8 per cent, in line with forecasts, while wage growth was up. It was the third month of outsized job gains in the last four and, for the first time since 2012, total Canadian job gains beat U.S. employment growth, which almost stalled in February with just 20,000 jobs created. Just days ago, the Bank of Canada held rates and said there was “increased uncertainty” on the timing of future hikes. The more dovish tone prompted markets to price in a chance that the bank might actually cut rates this year. “The economy clearly is not falling off a cliff by any means, arguably quite the opposite,” said Doug Porter, chief economist with BMO Capital Markets. Money markets were pricing in less than a 15 per cent chance of an interest-rate cut this year by the Bank of Canada, down from nearly 40 per cent before the data. The central bank has raised its overnight interest rate five times since July, 2017, though it has held it steady at 1.75 per cent since October, 2018. In a speech on Thursday, central bank deputy governor Lynn Patterson highlighted Canada’s strong employment numbers as one bright spot in a mixed bag of economic data. Canada’s economic growth slowed sharply in the fourth quarter of 2018 on plunging Canadian crude export prices. Consumer spending, exports and business investment have also all lagged expectations. The Canadian dollar strengthened to 1.3391 to the U.S. dollar, or 74.68 US cents, after the jobs data. It later curbed some of its gains as oil prices fell. The economy added 46,200 services sector jobs, led by professional, scientific and technical services for the third time in four months, along with 9,500 goods producing jobs, led by gains in natural resources. Strong full-time gains, mostly in the province of Ontario, offset a loss in part-time roles, with 67,400 full-time jobs added from January to February, and 11,600 part-time jobs shed. “This is a very strong indication of employer confidence, to create that many full-time jobs,” said Derek Holt, vice-president of capital markets economics at Bank of Nova Scotia. Young people aged 15 to 24 drove employment growth for the second consecutive month, accounting for more than half of total job gains. The average year-over-year wage growth of permanent employees – a figure closely watched by the central bank – was 2.2 per cent in February, up from 1.8 per cent in January.